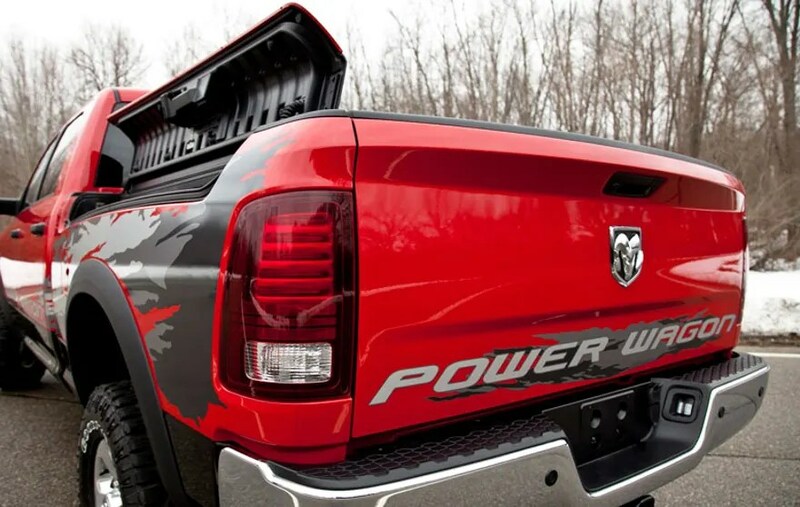 If Ram pickups wore superhero pajamas, the Power Wagon would be on them. The go-anywhere heavy duty truck is just about the biggest, burliest off-roader you can buy. Based on the Ram 2500, it’s nearly 7-feet tall, just shy of 20-feet long and weighs almost three-and-a-half tons. A jacked-up suspension and 33-inch tires help it ford water 30 inches deep. Don’t forget your waders. There’s 14.3 inches of ground clearance between the axles, but their extra-strength differentials hang down to 8.5 inches, so don’t try to straddle any big rocks. Putting a set of TruckNutz on one of these would be redundant. Nevertheless, a 6.4-liter HEMI V8 with 410 hp and 429 lb-ft of torque moves it around with the authority of a muscle car and can tow up to 10,810 pounds, despite its dirt-road chops. Since it’s so big, the Power Wagon doesn’t get an EPA fuel economy rating, but I saw 13 mpg on the highway courtesy of cylinder deactivation tech that lets it run on four cylinders as often as possible. This is truly a truck’s truck, and the one you would call when yours is stuck in the mud. I’m not usually one for decals on street cars, but the flashy Power Wagon graphics give it the appropriate look of a costumed avenger. You get it only on $50,340 SLT models, however, while an undercover Tradesman trim level starts at $45,690 and the upscale leather-wrapped Laramie goes for $56,015. All of them come with a 12,000-pound winch, a two-speed transfer case, front and rear locking differentials and a front sway bar that can be electronically disconnected at low speeds for extreme articulation over obstacles. If you still manage to get stuck, you’re on your own. Keep it engaged, and the on-road ride is better than you’d imagine. 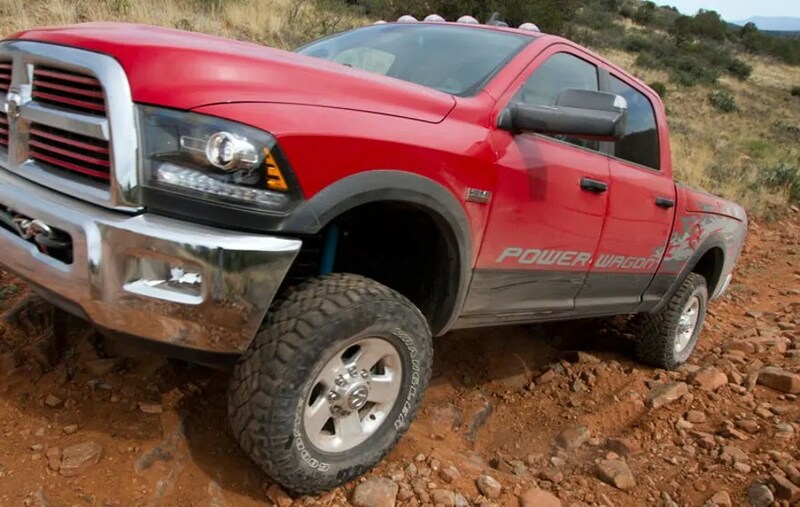 The Power Wagon rides on coil springs, takes turns well and doesn’t hop around too much even with an empty bed. The cabin is quiet, both audibly and visually, the latter being a little bit of a letdown. 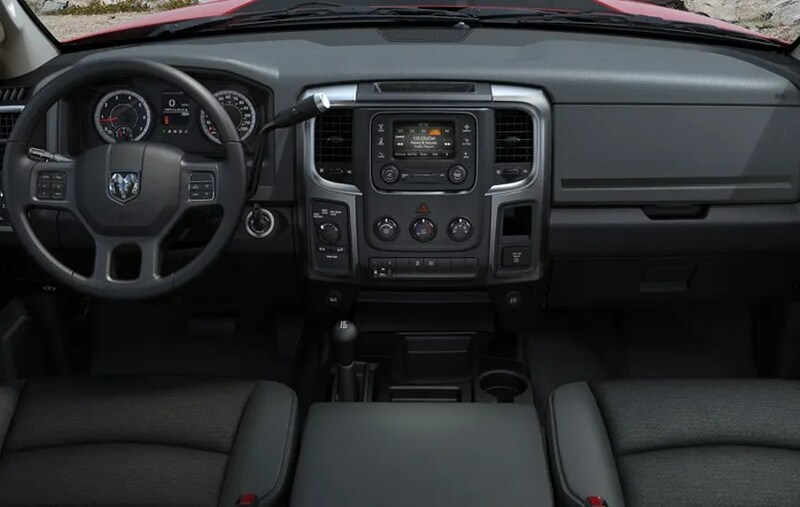 While it gets the same refined and feature-filled interior treatment that all Rams do, and a split front bench seat, there aren’t any Power Wagon-specific details to get excited about, so you’ll have to settle for the towering view. That view comes in handy on the trail. At about half a foot wider than a Jeep Wrangler, the Power Wagon requires a wide berth, as I learned on the off-road course at the Monticello Motor Club in New York, much of it better suited to something a wee bit smaller, which is pretty much everything. Of course, if you don’t mind a few dings and scratches, you can just step on the gas and blaze your own path. Timber! If this isn’t the official vehicle of Bro Country, I don’t know what is. I couldn’t help drifting it through the curves while yelling “yea c’mon!” to … well, myself. But I definitely looked like a boss when I did. Order one with a set of waterproof Ram Boxes in the bed sides, fill them with icy cold beverages and you’re sure to be the hero of the tailgate party, even if no one there needs a tow. Fiat Chrysler is offering the powerful sedan at a variety of price points. In an automotive marketplace redolent with boasts of fuel efficiency, sustainability and eco-friendliness, Dodge’s new fullsize Charger sedan arrives with a much different and politically incorrect promise: Unapologetic power. The Fiat Chrysler Automobiles FCA brand refuses to relinquish its U.S. audience of muscle-car admirers. Quite the opposite. FCA is promoting Charger with a few highly-powered versions powered by V8 engines, notably the 707-horsepower Hellcat. Built in limited numbers, the fire breathers are mainly meant to stoke demand for a mainstream Charger equipped with a V6 engine. Strengthening the fullsize sedan is a key element in the makeover of the Dodge brand since 2009, following Chrysler’s bankruptcy and its subsequent merger with Italian automaker Fiat to create a global automaker incorporated in the Netherlands. Ram pickup trucks, once sold as Dodge Ram, has been turned into a separate franchise; while the automaker’s minivan, sold as a Dodge Caravan and a Chrysler Town and Country, soon will be sold exclusively as a Chrysler. Tim Kuniskis, head of FCA’s Dodge brand, noted that many of today’s sedans “get lost in a parking lot,” since they look the same. Charger’s styling is meant to convey the aggressiveness of speed and power. The vehicle is likely to appeal to fans of NASCAR stock car racing, even though Dodge withdrew from the competition three years ago. “We wanted to offer something different in a fullsize sedan, some that wasn’t boring,” he said. In addition to the supercharged Hellcat—of which only a few thousand units will be built, at a price of $69,000—Charger also can be purchased with a 485-horsepower V8. But the Charger that will sell in mass volume is equipped with a 300-horsepower V6. It starts in price at about $28,000 and competes against Chevrolet Impala, Ford Taurus, Toyota Avalon and Nissan Maxima. With a V8, it has become a favorite of police departments and highway patrols. Increasingly, Chrysler Dodge Jeep and Ram brands are clustered under a single dealership roof. While branding remains separate in advertisements, shoppers might find a Jeep Cherokee, Ram pickup truck and Dodge Charger under the same roof. If that sounds like a dog’s breakfast of brands, it’s also one that seems to be attracting new customers, especially for Charger. “Our research shows that 40% of Charger buyers have never been in one of our dealerships,” Kuniskis said. “And 60% of those purchases lead to another” among the brands represented by FCA multi-brand dealers. With energy prices falling, an especially favorable sales environment might be gathering for the new Charger, the third generation of the full-size sedan introduced in 2005. A new Chrysler 300, built on the same architecture as Charger, will be shown in the next few months, adding heft to FCA’s U.S. lineup. True to its heritage as the automaker that popularized the minivan when others thought it wouldn’t fly, Chrysler has always marched to its own drummer – and not always so successfully. With the new Charger, FCA is sounding a contrapuntal note to the energy saving, diminutive sizing and resource conservation that characterize automaking; it’s a note that could redound to its benefit. October 22, 2014 , Auburn Hills, Mich. – The Dodge Durango, Dodge Journey and Jeep® Grand Cherokee EcoDiesel were each named winners in this year’s Active Lifestyle Vehicle (ALV) awards. The 11th annual Carspondent.com “Active Lifestyle Vehicle of the Year” awards competition took place at Local Motors in Chandler, Ariz., on Sat., Oct. 18. More than 100 athletes and outdoor enthusiasts from around the country who participate in sports, such as marathon running, bicycling, soccer and kayaking, evaluated and judged new vehicles in the 10 award categories in this unique competition. The ALV awards are the only annual vehicle awards in which active, outdoor enthusiasts choose the winners, along with a small contingent of automotive journalists who accompany them in the ride-and-drive tests. Testing includes a challenging off-road course as well as on-road driving. “This year’s Active Lifestyle Vehicle of the Year was the most competitive in the program’s 11-year history with hundredths of a point often determining category winners. Jeep and Dodge resonate with our audience because of the brands’ outdoor focus, versatile yet stylish interior designs and strong powertrains,” said Nina Russin, a co-founder of the Active Lifestyle Vehicle of the Year awards. With a standard eight-speed automatic transmission, improved fuel economy and performance, LED exterior lighting, two interior touchscreens, a programmable instrument cluster and an available high-definition dual-screen Blu-ray entertainment system, the Dodge Durango reaches even higher levels of sophistication building on its proven performance, utility and comfort. Named one of Ward’s 10 Best Engines for three years, Durango’s standard 3.6-liter Pentastar V-6 engine paired with the standard eight-speed transmission generates an impressive 290 horsepower (295 horsepower on Rallye, Citadel and select Blacktop models) and 260 lb.-ft. of torque, and can tow up to a best-in-class 6,200 pounds. The V-6 powered Durango also features a best-in-class driving range of over 600 miles on a tank and up to 25 miles per gallon. The available 5.7-liter HEMI V-8 engine produces a best-in-class 360 horsepower and 390 lb.-ft. of torque with a best-in-class tow rating of 7,400 pounds. The 5.7-liter engine’s Fuel Saver Technology with cylinder-deactivation allows the HEMI V-8 engine to achieve up to 23 miles per gallon. The instrument panel features a redesigned center stack that houses the 5-inch and 8.4-inch Uconnect touchscreens. The bottom of the center stack houses a media hub with an SD card slot, USB outlet and auxiliary jacks, as well as a storage bin. The center console features a segment-first rotary shifter for the standard eight-speed automatic that adds another level of refinement over the traditional gated automatic shifter. The instrument cluster has also been given the high-tech treatment and now includes a full-color 7-inch thin-film transistor (TFT) screen. Standard on all models, this screen allows for drivers to customize in more than 100 ways how information is presented. Dodge Journey is America’s most affordable and versatile crossover and is the only crossover in the segment to offer the choice of four- or six-cylinder engines, five- or seven-passenger seating and front or all-wheel drive. Journey continues to deliver the latest in vehicle connectivity and customization with the Chrysler Group’s Uconnect 8.4 infotainment system. With best-in-class storage space, available fold-flat seats, second-row in-floor storage and front-passenger “Flip-N-Stow” in-seat storage, the interior isn’t just a nice place to be, it also offers best-in-class utility. The Dodge Journey has more than 40 safety and security features, and is America’s most affordable seven-seat crossover with a starting MSRP of $19,995. The Dodge Journey is available in AVP, SE, SXT, Crossroad, Limited and R/T trim levels. Jeep Grand Cherokee — the most awarded SUV ever and the vehicle that has long defined what a premium SUV should be — receives even more content for the 2015 model year. The Grand Cherokee Summit models receive added features as well as a new Summit California Edition appearance package that further enhances Summit’s premium exterior aesthetics. Jeep Grand Cherokee delivers best-in-class 30 miles per gallon (mpg) highway courtesy of an available 3.0-liter EcoDiesel V-6 engine and standard eight-speed transmission. The 3.0-liter EcoDiesel V-6 boasts an unmatched driving range of more than 730 miles. A refined exterior design — complete with available bi-xenon headlamps with signature LED daytime running lamps (DRL) — provides a premium appearance. Interior luxury is achieved with premium amenities, including Natura leather, exotic open-pore wood trim and unique color offerings. The 2015 Jeep Grand Cherokee is available in five trim levels: Laredo, Laredo E, Limited, Overland and Summit. When it comes to SUVs, you can choose a crossover SUV that drives like a car and excels on paved surfaces, you can get a traditional SUV that drives like a truck and excels on unpaved surfaces, or you can get a 2015 Jeep Cherokee, which does it all – and well! 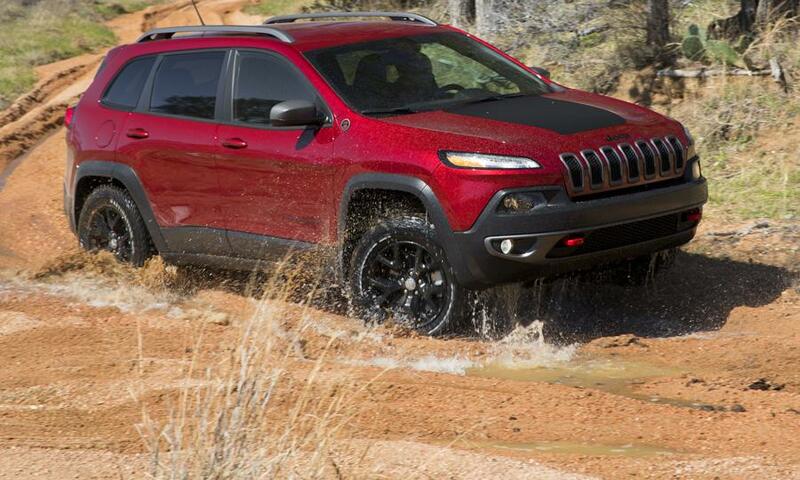 The Jeep faithful will love the ruggedness of the Cherokee Trailhawk model, pictured here. But all SUV buyers will appreciate the new Cherokee’s level of sophistication, safety, economy and value. There are some recognition issues concerning the 2014 Jeep Grand Cherokee. And that’s a good thing. Why? Because the latest version is quite the departure from previous models. A 2014 “refreshening” has given the Grand Cherokee a more modern, sophisticated look that will have admirers giving it the double take. And that’s certainly a good thing because previously the Grand Cherokee was extremely basic and possessed little personality. The latest design incorporates reshaped headlights, a 7-slot front bumper grille, and possesses a nice overall appeal that was overdue. When it arrived on the scene nearly two decades ago, there was plenty of interest in the Jeep Grand Cherokee. Sales people were making a nice living off this rugged sport utility vehicle throughout much of the mid-to-late 1990s when sales were exceeding 300,000 per year. However, when gas mileage became more of an issue and crossover SUVs came into vogue, sales of the less-refined Grand Cherokee dipped. Jeep was slow to make significant changes until 2011 when a major redesign made a dramatic refinement statement. The changes shouldn’t alarm loyal Grand Cherokee owners. One of its core traits remains – off-road features. What’s cool about the Grand Cherokee is the versatility, which not a lot of modern SUVs can match. The midsize version does a little of everything, retaining its ability to go off-road and transport as many as five people on a daily commute. 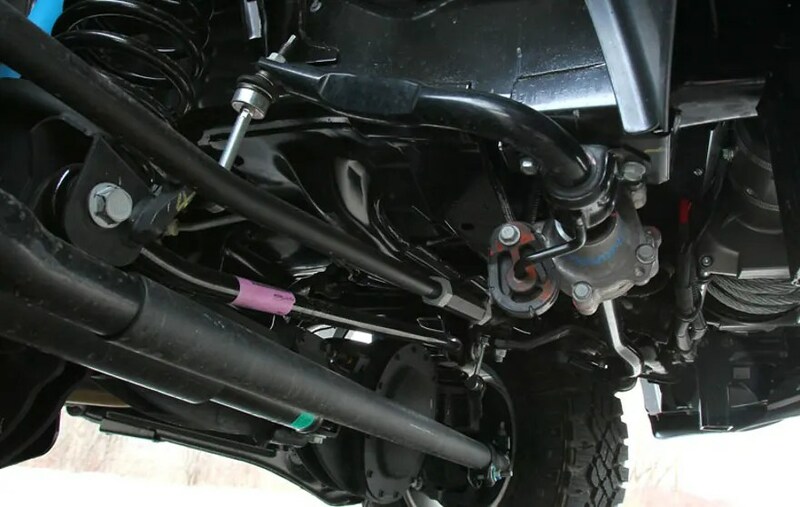 The Grand Cherokee provides generous ground clearance (11.3 inches maximum) with its optional adjustable air suspension. And another available upgrade is the sophisticated four-wheel drive system. The Grand Cherokee has climbing power and a drive-mode selector that makes it more efficient in taking on specific types of terrain. For car buyers who care very little about off-road capability, the Grand Cherokee should be appealing as well. It features a roomy interior, a performance-laden engine, and the ride is much improved, with handling similar to some crossover SUVs. The Grand Cherokee base model is offered at a reasonable $29,495 sticker price. Don’t be fooled into thinking that same bargain price also applies to the other three main trim models, which rise significantly. The standard powertrain is an efficient 3.6-liter, V6 that produces 290 horsepower and 260 pound-feet of torque. The rear-wheel drive Grand Cherokee accelerates from 0-60 in approximately 7.9 seconds, which is slower than most rivals. Gas mileage has been improved to 17-23 mpg. There are other performance options to consider, including a 5.7-liter, V8 that has 360 horsepower and 390 pound-feet of torque, and the turbocharged 3.0-liter diesel V6 that garners 240 horsepower and 420 pound-feet of torque. The 2014 lineup also features a high-performance Grand Cherokee that may intrigue some car shoppers. But beware of the high price – the top-of-the-line SRT goes for more than $64,000. And what are you getting for that major hike? A powerful SUV that features a 6.4-liter, V8 that elicits 470 horsepower and 465 pound-feet of torque, plus a sizable list of luxury features. The SRT8 can tow up to 7,400 pounds, but note that its gas mileage (12-18 mpg) is less than traditional Cherokees. The poor gas mileage isn’t surprising because the SRT8 goes 0-60 mph in a very quick 5.1 seconds. Previous Grand Cherokees were devoid of a sophisticated interior and hard plastic was more the rule than the exception. The new models have softer material and a more appealing look, including wood trim on all but the base model. The Grand Cherokee also provides comfortable seating for both front and back seat folks, and lots of convenient storage areas. There are several negatives that should be noted. The Grand Cherokee has no third row, so the maximum seating is five people. The cargo space is fairly limiting, but the split back seats do fold nearly flat to greatly increase the cargo capacity. The optional navigational system has a tiny screen and is very unintuitive. There are plenty of reasons to give the new Jeep Grand Cherokee a look, and comparing it to its primary competitors – Ford Explorer and Toyota 4Runner. The base model Cherokee comes at a great price and the other trim models feature that rugged off-road experience that can’t be found these days in many SUVs. The 2015 Dodge Charger SRT Hellcat — the most-powerful production sedan ever — will start at $63,995, officials announced Friday. The pricing includes a $1,700 gas guzzler tax but excludes a $995 destination fee. It is $4,000 more than the starting price of its Dodge Challenger Hellcat sibling at $59,995. At the heart of the Charger Hellcat is Chrysler’s new supercharged 6.2-liter Hemi Hellcat V8 engine, which produces 707 horsepower and 650 pound-feet of torque and clocked an NHRA-certified quarter-mile elapsed time of 11.0 seconds. The Charger Hellcat, thanks to aerodynamics, will have a top speed of 204 miles per hour — five more than the Challenger Hellcat. 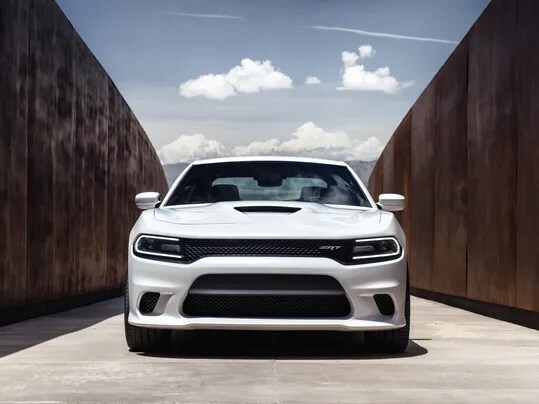 “The Charger is now tighter, leaner and more athletic, without sacrificing the proportions, performance, driving dynamics, attitude and price that attracted customers in the first place,” said Dodge and SRT President and CEO Tim Kuniskis in a statement. The Charger Hellcat anchors the 2015 Charger lineup, which includes nine models starting at about $28,000 for an entry-level SE with a standard 3.6-liter Pentastar V6 engine with 292 horsepower. For the 2015 model-year, the Charger received a full-body makeover and received numerous performance and technology upgrades, including a standard eight-speed automatic transmission, e-shifter and push-button start. Production of the 2015 Charger is scheduled to start Oct. 27 at the company’s Brampton Assembly Plant in Ontario, Canada, followed by the vehicle’s arriving in dealerships in November. Dealer ordering started earlier this month, according to a company spokeswoman.